"Filthy? She has no idea. If we had a blacklight, it would look like a Jackson Pollock painting." And Star Lord's spacecraft isn't the only thing that quote applies to. 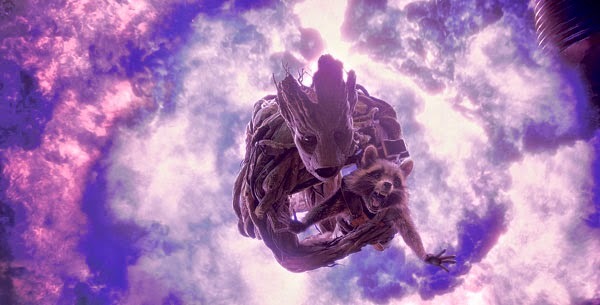 Guardians of the Galaxy is a film that explodes colour on every level. Finally the movie that shows comics and comic films don't have to be dark or uber sophisticated to be awesome has arrived. It's got humour, it's got heart, it's got action and it's got evil, but most of all, Guardians has got a dancing Baby Groot, trying not to be busted by a knife-sharpening Drax the Destroyer. What that should tell you, is that what Guardians does best is navigate the asteroid field that is 'humour vs action'. Balancing out scenes like the one mentioned above, with those like where Star Lord aka Peter Quill (Chris Pratt) fails to take his mother's hand and instantly lives to regret it. Flashing forward twenty odd years, Quill is now the solo Han Solo bounty hunter type, searching the cosmos for treasures to replace the one he never could. His latest target, a silvery orb, will put him in the crosshairs of daughter of Thanos, Gamora (Zoe Saldana); along with fellow bounty hunters Rocket Raccoon (voiced by Bradley Cooper) and Groot (voiced by Vin Diesel). Gamora wants the orb to betray Ronan (Lee Pace), the sadistic Kree military commander who thirsts for its possession in order to ‘hire’ the mad God-like Thanos to crush the Xanadarian homeworld from existence, and its police-like Nova Corps along with it. Rocket and Groot, being simpler creatures, just want to capture the booty of bounty on Star Lord's head. Yip, that's our team. On a bit of a tangent while we are talkin' Rocket - one of the best stories to come from this film, is that Marvel arranged a private viewing for Rocket's co-creator Bill Mantlo and those close to him (against legal and security protocols - whatever the hell they are). The severely debilitated comic creator rewarded Guardians with a smile the likes of which those at his side have rarely seen since his car crash, and two thumbs up. Awesome job Marvel - that's the kind of creator stories we need more of (more here)! 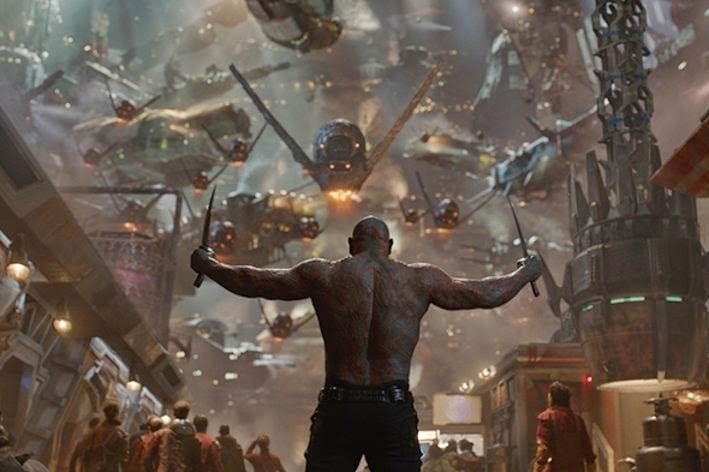 Getting back on track with our rag-tag bunch, their slapstick efforts to reach their own objectives sees all four quickly incarcerated in the same penal system Drax the Destroyer (Dave Bautista) currently calls home. With his family decimated by Thanos's forces, he sees Gamora as the first available step in his revenge. The only thing standing between her head and the floor - Star Lord, a human who has just lost his most important possession - a walkman full of Motown era music. Gotta love those Temptations. Why the Walkman is so dear to our hero (or why he chose the name 'Star Lord') goes to the heart of this film. As the scales shift from 'aww' to 'bru-haha' to 'ouch - that had to hurt' and back again, the cosmic spectacle of this film is unrivalled in anything Marvel has produced so far. As the team arrives at The Collector's HQ and the true secret of the orb is revealed, the kooky gets crazy. Drax and Ronan betray their allegiances for personal glory and Star Lord betrays his loner nature for his heart. In what follows, your eyes will have a hard time taking all the action in - although I was only using one - the other was constantly scanning every Xanadarian scene for any slight hint of a certain New Warrior's rank within the Xanadarian Nova Corps! While Drax is my fanboy fav, and Rocket is undoubtedly the star, Chris Pratt does his best to come a close second, anchoring the film as he does so. As a fan of the Guardians comic right up to the end of writers Dan Abnett and Andy Lanning's run (without which I'm not sure this film would exisit, especially so early in the life of Marvel Studios), the darkness was a little lighter than what I was used too, but moments like seeing Knowhere and the straight-talking Rocket snarl at his in comic adversary/ally Cosmo the dog made me giggle like the Joker watching an episode of MTV's Ridiculousness. If Darkhawk had shown up I think I would've died right there. On threat of obliteration, if I had to find one negative of the film, it would be that the after-credit scene isn't worth waiting for. The fact the creators of the character that appears in it got a whole screen of thanks to themselves, while we had search for the likes of Jack Kirby's hat-tip in amongst the scrolling credits of the thousands of talented hands that touched this film, just ticked me off. With Captain America: The Winter Soldier being a pretty flawless film and Guardians following suit (albeit in a different genre), the pressure is now on for Avengers 2 to continue Marvel's record winning formula. The Avengers golden boys, who all had their own solo feature films first, under pressure from a standard set by characters the non-comic world's never heard of, a bunch of self-confessed losers, that's the kinda stuff that keeps me a fan of modern comics. Let's show the audiences out there we do more than dark gothic cities and angry feral Canadians. We do your favourite characters you've never met, in locations and situations you could never dream. We call these comics, and we invite you to read more about them. Lets not just repeat 'I am Groot' over and over - we have the guy that does that best - let's all be Guardians of the Galaxy. 'Nuff said. That's a most consice and thorough review, Dan. 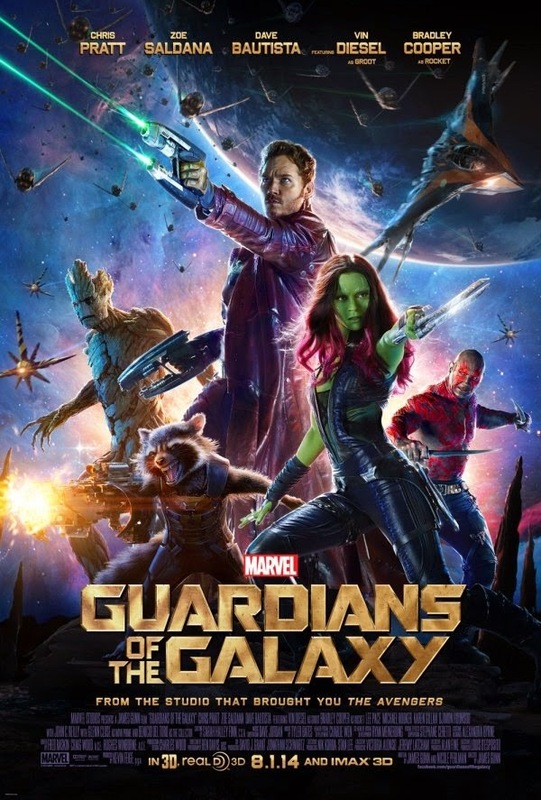 I must admit the GOTG never really did it for me, but I saw this movie the other night [Thursday] and have to admit I agree with most of your feelings about it. One big laugh fest after another, one of those-swtich-your -brain-off-and -enjoy-it type summer movies. Thanks Karl - glad you liked it mate. Yeah I definitely think Guardians will have a longer shelf life in peoples collections in the future, pretty much because of that feel good vibe. See the soundtrack is doing pretty good to, which has to be a Marvel first. A feel good heart felt action adventure. GOTG is a comic book on screen. It's not Annihilation which I absolutely luv. However I think it's exactly what the genre needs. Marvel is doing it. Oh I can't leave without saying, on or off screen Rocket Raccoon is a damn star. Thanks O.A! I think Rocket is a show stealer too. Even Bradley does a great job at customising his voice to the little fellah too. If Annihilation is what Ultron's appearance in Avengers 2 is building towards, I would die happy. Although with the Surfer and Annihilus caged up by rights at Fox, I to think it might be an impossible request at the moment. Good to hear from you again mate! Anyone notice how many awesomely hot guys in Marvel movies are named Chris? I think that just may be me. This was such a great movie. I loved the freaking squirrel, which I never thought would happen, and could watch it over and over again. Which, as anyone who knows me knows, doesn't happen unless the movie involves Thor in some capacity. Plainly speaking: IT'S FUN!!!! Just pure, unadulterated fun. With PLOT. I want Gunn to do a Saga movie. And here I thought hotness was genetics, now I know that's just mutant powers. Well at least till 'Chris is my middle name' catches on. Oddly the movie I wanted to see Gunn make next is DC based, the fun just seems very Doom Patrol or Perez/Wolfman Teen Titans level. Brother Blood, Trigon, Deathstroke and the Teens - leading up to a Judas Contract - that would be cool. We haven't had super-hero traitors in films yet. Still next one I'm holding out for - come on Vision! !